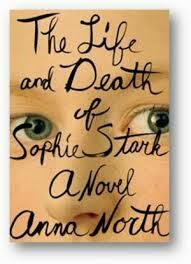 The Life and Death of Sophie Stark by Anna North was chosen by my IRL book club (as opposed to my online book club, obvs). One of the things I love about book clubs is that it introduces me to books I wouldn’t have read otherwise, perhaps because I don’t get to go to bookshops or libraries that much at the moment, or because, in all honesty, it would have gotten lost amongst the other samey covers/titles on the tables in Waterstones. I’m glad it didn’t get lost. There will be spoilers in this review, so please don’t carry on if you don’t want it spoiled. 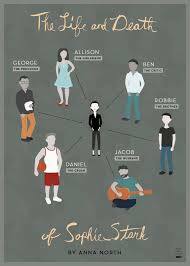 The format is interesting in that it’s told from the perspectives of a few different people, who quickly are identified as important people in the titular Sophie’s life (and death). A brother, a lover, an agent. A first crush and husband. Sophie’s voice is absent, of course, but comes through as a layering of the recounting of her career as a promising film director. As we hear from more people and follow her journey from weird girl at school to, well, weird woman with a budget to make films, the picture becomes clearer. Sophie Stark isn’t even Sophie Stark as she changed her name before university. The first film she makes, about the all star basketball player whose girlfriend shaves Sophie’s head in an attempt to make her stop stalking him, is an underground success. From there, all of her films are successful at the expense of someone else. She makes a film about her husband’s dying mother’s suicide without his permission, and uses a personal and intimate secret about her girlfriend’s past in a film that her girlfriend is playing the lead in. There is a wider question about Sophie’s moral compass, the outcome of which depends on your own standpoint, of course. I didn’t like her as she seems to be able to pick and choose when she feels emotion, and uses those closest to her in the name of Art. That might be because I just don’t understand that level of creativity. I’ve never been driven by that need to Make Things and to express emotion so vividly and powerfully that nothing can stand in my way. I mean, apart from my teenage diaries, of course. She lives, she dies and inbetween she makes beautiful films. The trouble with the medium of film in a book is, of course, that we take their word for it that it’s beautiful, through the description and reaction of the people around them and the audience. Although it wasn’t an amazing story, I still enjoyed the descriptions and I was still taken aback at her death. She isn’t a sympathetic main character, but I didn’t hate her enough to enjoy her death. I probably won’t read this again, but I did like reading it and it was reasonably quick to read too. A good beach novel, for when the summer finally arrives.